I like the old-school style of this sign. I wonder if the lights are turned on at night. 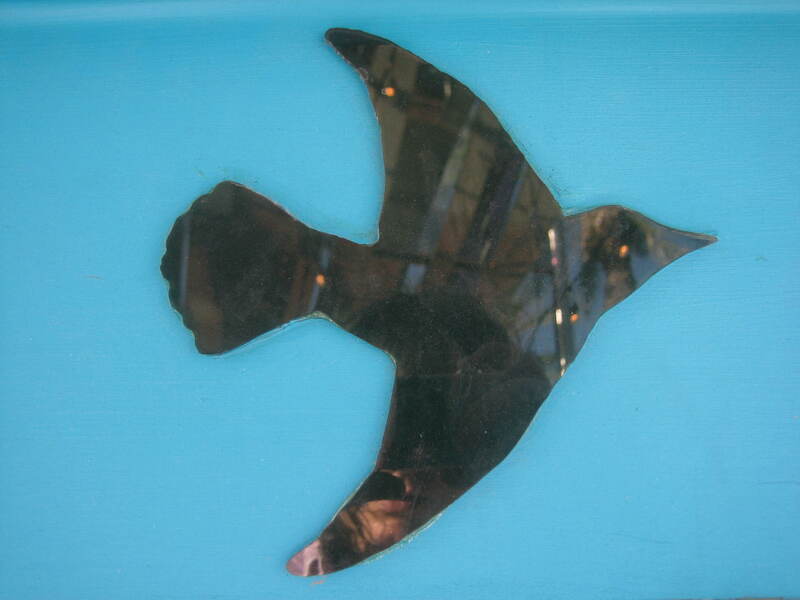 When I was in San Francisco, I spent a lot of time walking around in the Mission District. The Mission is a vibrant, bustling neighborhood with great opportunities for watching people . I enjoyed getting a glimpse of folks living their lives in a metropolis. Being in the Mission made me remember how it feels to love a city. In addition to people watching, I looked at the murals that are all over the Mission. My Computer Guy says the Mission has been known for its mural since the 1970s, and and the SF Tourism Tips website (http://www.sftourismtips.com/mission-district-murals.html) backs him up. 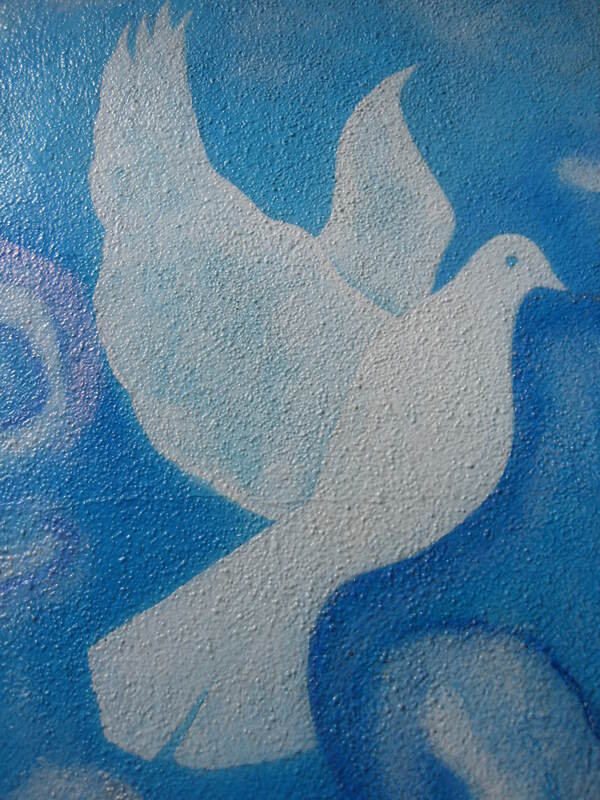 In previous trips to the Mission, I did see murals, but during my recent visit, I saw so many murals I had never seen before. Maybe I hadn’t been looking in the right places during previous visits. Maybe there really are more murals now. In any case, I spent much of my visit walking around the neighborhood, finding and admiring and photographing outdoor murals. I spent an entire afternoon walking around 24th Street, ducking into alleys to take photos of the amazing murals located throughout this neighborhood. From across 24th Street, I saw La Reyna Panaderia and decided I would pay it a visit after lunch. 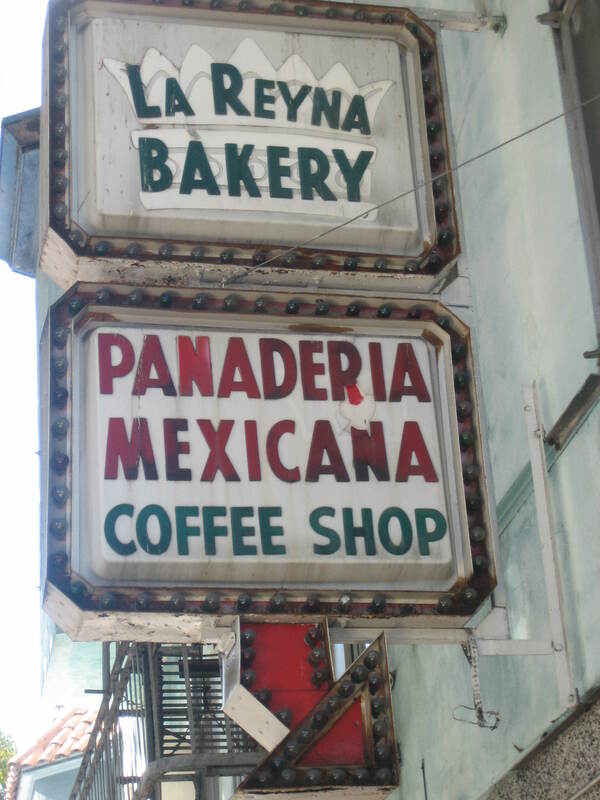 “Panaderia” is the Spanish word for bakery, and there was a wide selection of sweet treats available at La Reyna. I don’t know much about the pastries of the Latino world, but everything on display looked really delicious. I wanted to try everything! I tried to joke about wanting to try everything to the woman working behind the counter, but she wasn’t having it. I don’t know if she was having a bad day or if she was just tired or if her English comprehension was limited and she didn’t understand my banter, but she didn’t seem amused by me in the least. So this is how it works: Customers get a tray and a set of long tongs from the counter and serve themselves from the cases filled with a variety of pastries. Only a few of the pastries were labeled, so I didn’t really know what most of the varieties were. In theory, I guess I could have asked the woman working, but she did not act as if she wanted to be bothered by me. So I picked a big, soft-looking cookie that was obviously chocolate and another that was sprinkled heavily with toasted coconut and had a red circle that looked like jelly in the middle. There was no indication of the price of anything, but my two cookies ended up costing $1.30. While La Reyna’s sign does say “coffee shop,” I didn’t see or smell any coffee brewing. Maybe the lady behind the counter whips something up after an order is placed. I wasn’t interested in coffee, so I didn’t really look for it. La Reyna also seemed not much like a coffee shop because there are no tables or chairs, either inside or out. It’s not a hangout kind of place. One goes in, buys one’s pastries and leaves. This is a great place for folks who like Mexican pastries, but it’s strictly a “to-go” situation. Like many other buildings in the area, the one that houses La Reyna has murals painted on the side of it, including one of the Virgin Mary. La Reyna (also spelled “La Reina”) is the Spanish term for “The Queen.” The Queen in question might be the Virgin Mary (you know, as in “the Queen of Heaven”) which could explain why she’s painted on the side of the outside wall. 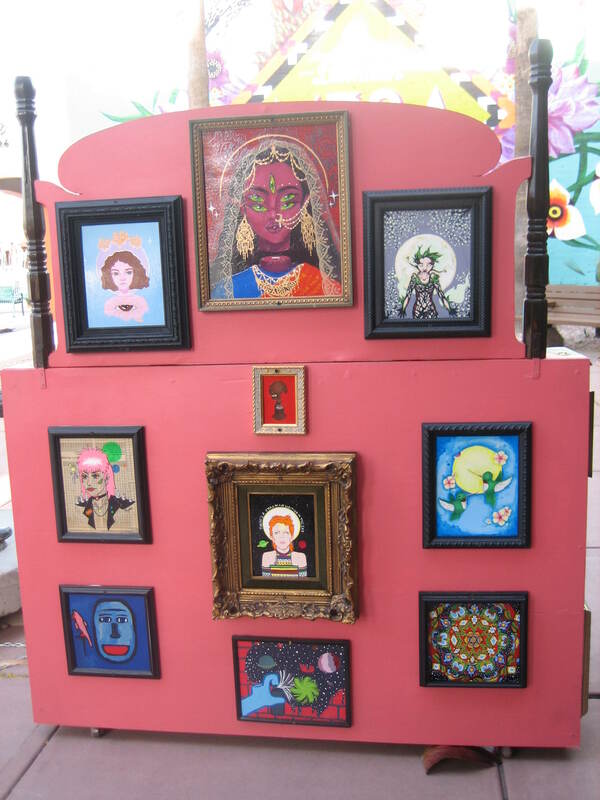 However, The Queen might refer to someone else, and the Virgin Mary’s on the side of the building because she’s a popular art motif in the Latinx world. 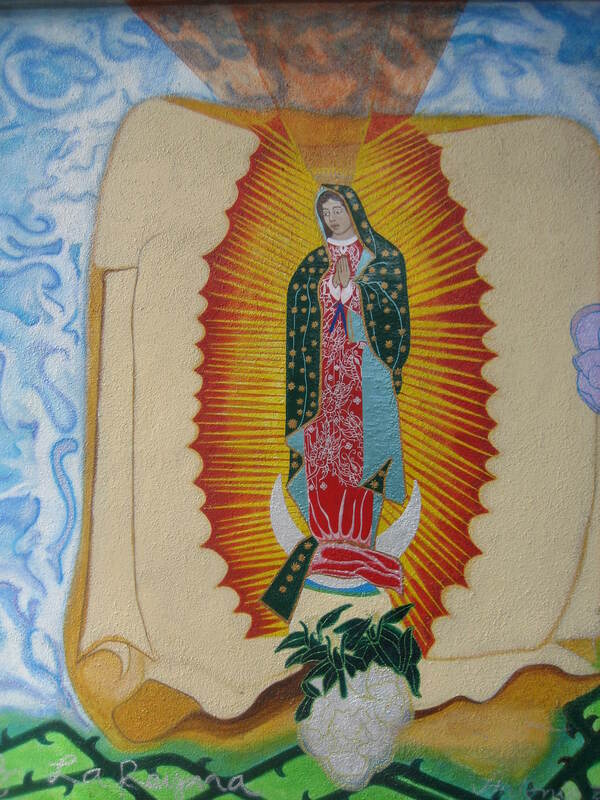 The words “La Reyna” written under this mural of the Virgin Mary on the side of the building housing La Reyna Panaderia indicate my idea that the bakery is names after the Queen of Heaven is correct. My two cookies were big, and I savored them over the course of the next couple of hours. I ate a few nibbles while leaning against a tree outside of the bakery, listening to cops question a man sitting at a bus stop. I ate a few more nibbles while sitting at a bus stop bench on Mission Street and watching city people live their lives. Both cookies were delicious, flaky and crumbly. 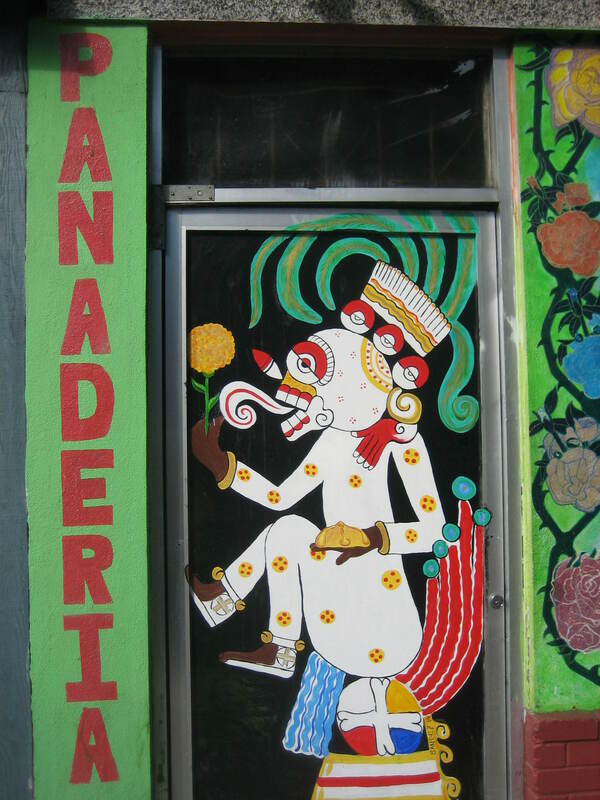 La Reyna Panaderia is located at 3114 24th Street in San Francisco, CA. My friend’s birthday was approaching, and I wanted to make something special for her. I sent her a hat a while back, and now she lives in the desert, so she didn’t really need another one or an infinity scarf either. I made a hemp necklace for one of her pendants two visits ago, and I didn’t know if she would like any of the necklaces I already had made. And oh, yeah, I’d traded her some bracelets for a copy of her zine a couple of years ago. She probably didn’t need any more bracelets. My last option was a collage. Yes, yes, a collage! I wanted to make a collage with an inspiring quote on it. My friend is a peace activist, so when I found a good quote about peace from Jimi Hendrix, I decided to build the gift around his words. 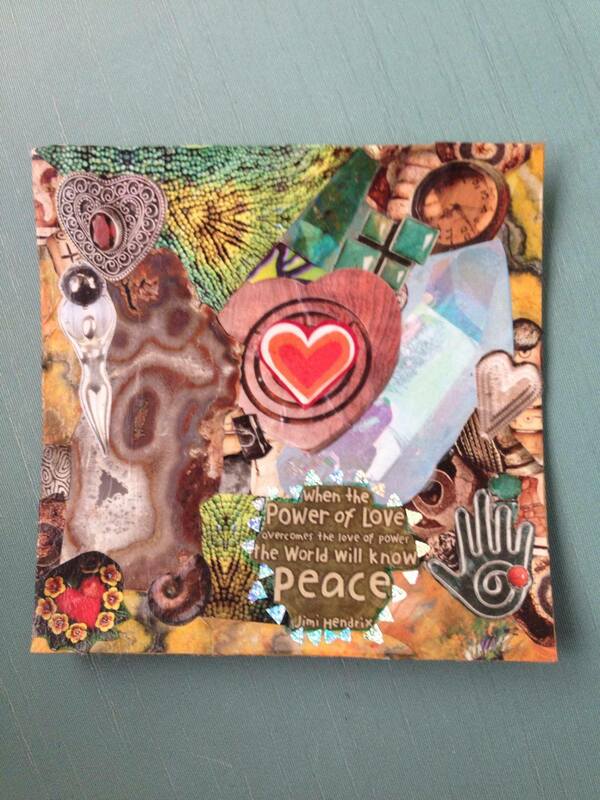 My friend took this photo of the collage I made for her. I forgot to take a photo of it before I put it in the mail. Since I love my friend, I used many hearts in the piece. I hope this work of art conveys to her how much she means to me. Happy birthday, my friend, happy birthday to you. 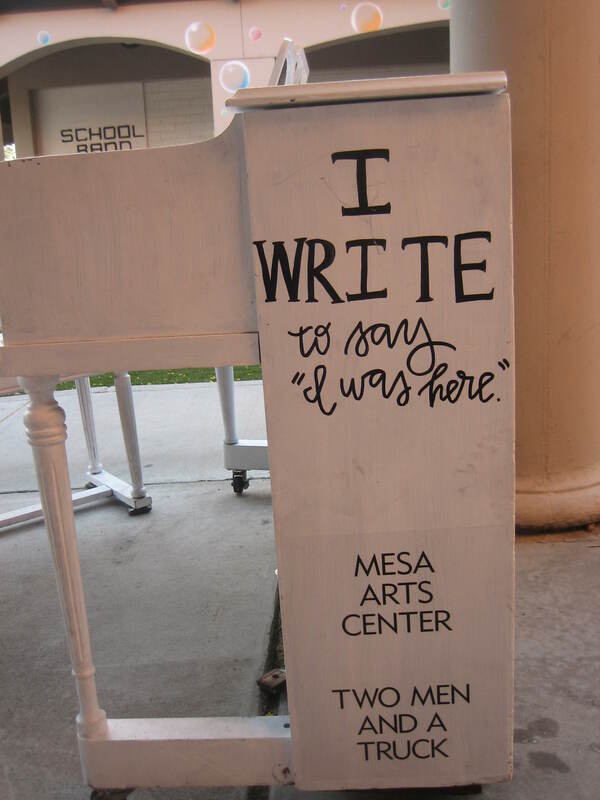 In the third post about the Play Me, I’m Yours piano installation in Mesa, AZ, I mentioned one of the reasons for writing given on the piano presented by Phonetic Spit was this: I write to speak my mind, even when my voice shakes. I knew I’d seen some variation of the quote before, but who’d said it? Audre Lorde? Alice Walker? I did a Google search and found Maggie Kuhn was the woman who gave us those words. Who’s Maggie Kuhn? I didn’t know either, until I did a little reading up on her. The Wikipedia article about Kuhn tells more about the work she and the Gray Panthers did. In 1970, although [Kuhn] was working at a job she loved with the Presbyterian Church, she was forced to retire the day she turned 65 because of the mandatory retirement law then in effect. That year, she banded together with other retirees and formed the Gray Panthers movement. Seeing all issues of injustice as inevitably linked, they refused to restrict themselves to elder rights activism, but focused also on peace, presidential elections, poverty, and civil liberties. Their first big issue was opposition to the Vietnam War. Kuhn raised controversy by openly discussing the sexuality of older people, and shocked the public with her assertion that older women, who outlive men by an average of 8 years, could develop sexual relationships with younger men or each other. Leave safety behind. Put your body on the line. Stand before the people you fear and speak your mind–even if your voice shakes. When you least expect it, someone may actually listen to what you have to say. Well-aimed slingshots can topple giants. 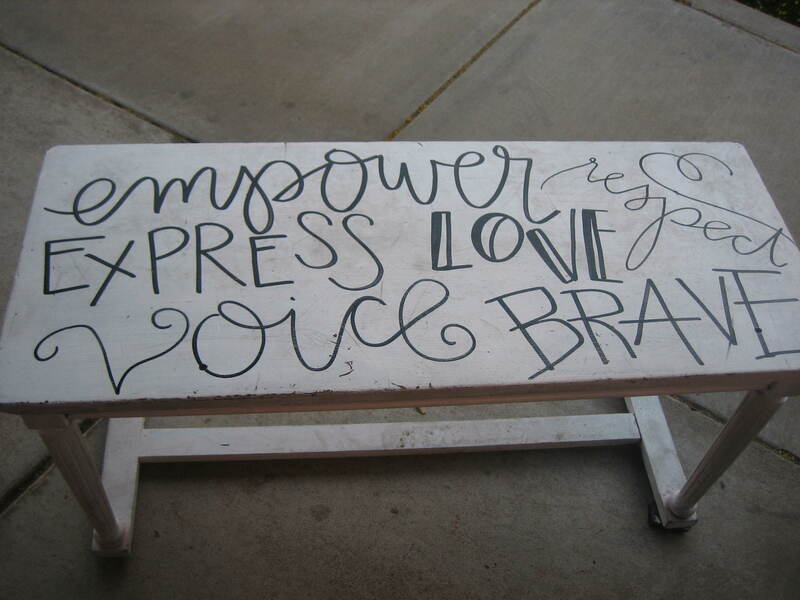 I suspect Maggie Kuhn would be quite pleased to know young people remembered her sentiment and wrote it on a piano in an Arizona town for all to see. 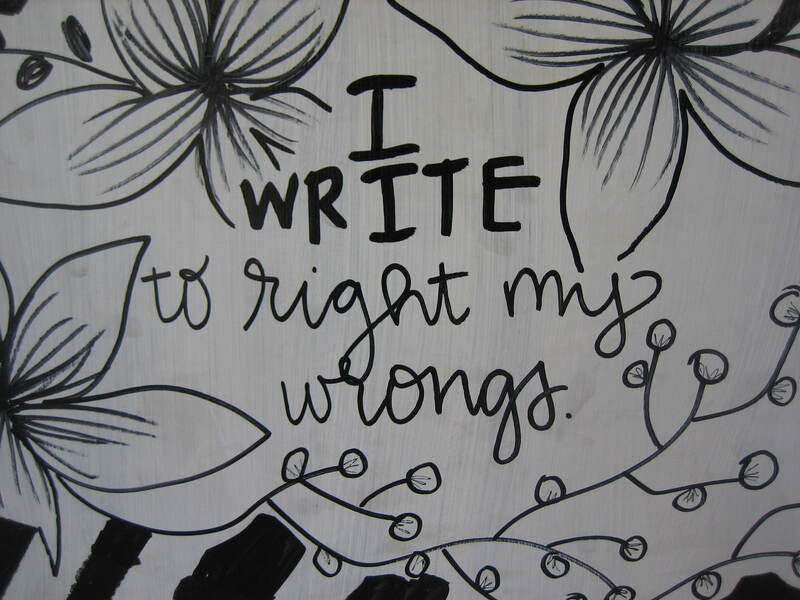 I write to right my wrongs. I write because the pen is my weapon. I write because my ancestors weren’t allowed to. I write to honor my second chances. I write to relieve myself from pain. I write to speak my mind, even when my voice shakes. Through the intersections of Literary Arts, Youth Development, and Social Justice programs, Phonetic Spit creates Brave Space to empower young and emerging adults to find, develop and publicly present their voices as agents of societal change. I can understand how a group of young people interested in the literary arts, publicly presenting their voices, and societal change would use this opportunity to tell the world why writing is important to each of them. a poet, writer, teaching artist, and community activist. He says he’s a self-taught artist dedicated to advancing the art of spoken word through fusion with theatre and dance. Stanton is co-founder of Phoenix’s premiere youth spoken word ensemble, Phonetic Spit. He uses hip-hop pedagogy to inspire youth to boldly express themselves through poetry, dance, theatre, and graffiti. His work and teaching style is rooted in his childhood experiences of poverty and single parent household, political issues, identity, and love. 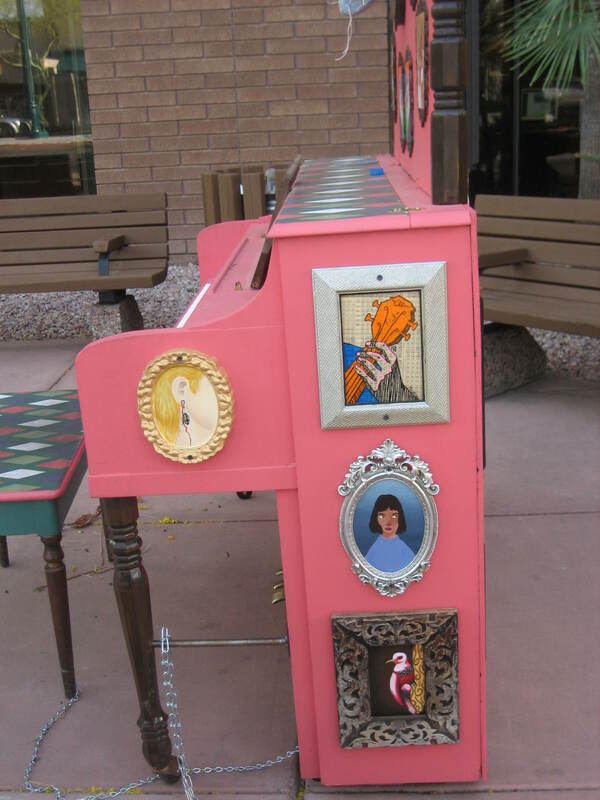 This piano’s Street Pianos webpage also says it was donated by the First United Methodist Church of Mesa and was sponsored by Two Men And A Truck. 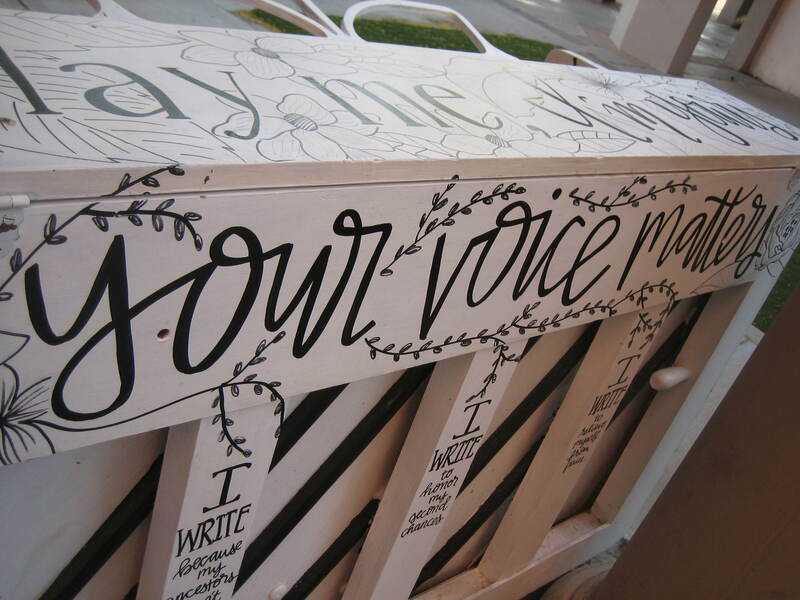 My favorite words on this piano read, “Your Voice Matters.” This message is important to everyone who may feel silenced in the current political climate. Every voice matters. Some will say the only voices that matter come from the throats of the rich or the males or the people with light skin. This is not the true. The truth is every voice matters. My voice matters and your voice matters. Let’s all speak our minds, even when our voices shake. Touring internationally since 2008, Play Me, I’m Yours is an artwork by British artist Luke Jerram. Reaching over 10 million people worldwide – more than 1,500 street pianos have already been installed in over 50 cities across the globe, from London to New York, bearing the simple instruction Play Me, I’m Yours. Located on streets, in public parks, markets and train stations the pianos are temporarily available for everyone to play and enjoy. 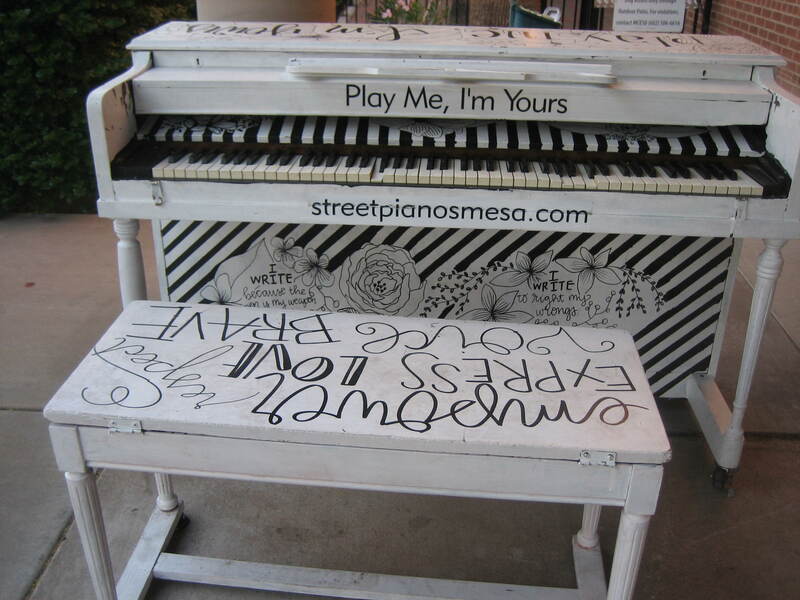 Play Me, I’m Yours invites the public to engage with, activate and take ownership of their urban environment. 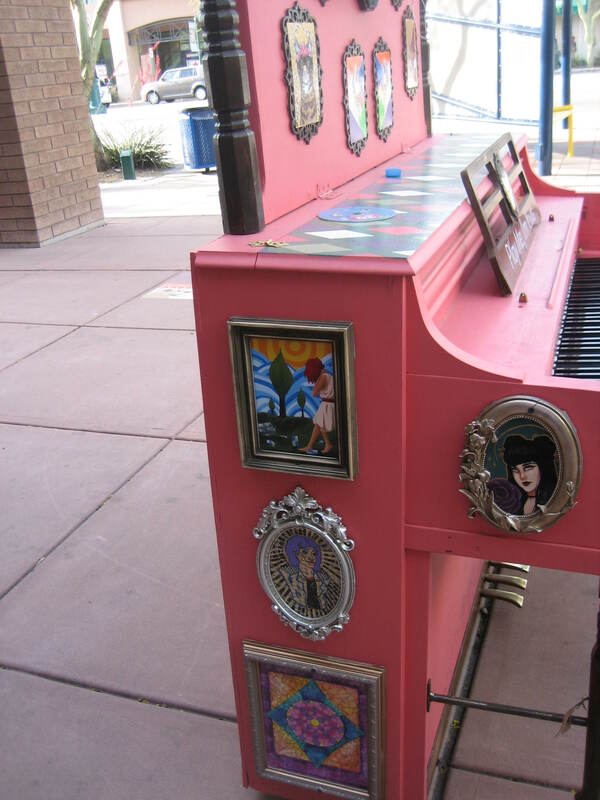 Decorated by local artists and community groups, the pianos create a place of exchange and an opportunity for people to connect. 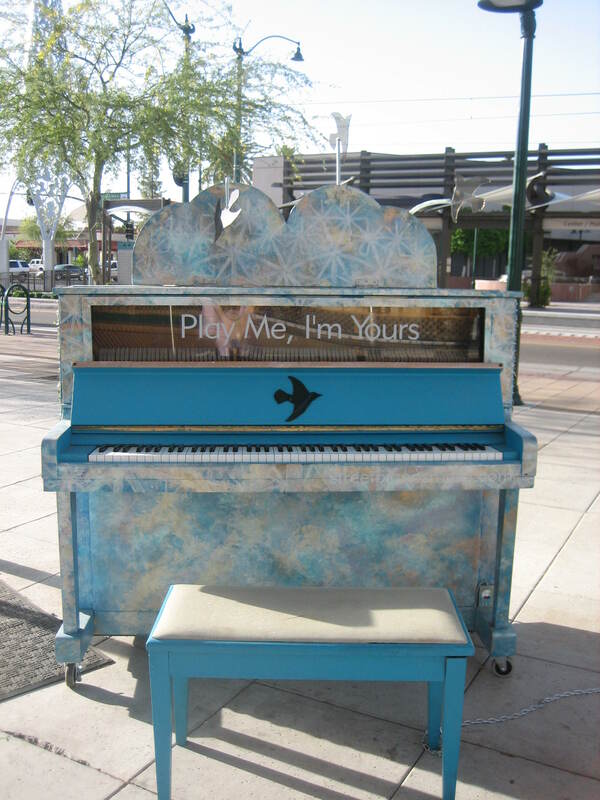 The second Play Me, I’m Yours piano I encountered during my evening stroll along Main Street in Mesa, AZ was in front of the Mesa Contemporary Arts Museum. This one was looked like a cloudy blue sky, and the sides shimmered in the late afternoon sun. Luke Jerram’s multidisciplinary practice involves the creation of sculptures, installations and live arts projects. Living in the UK but working internationally for 19 years, Jerram has created a number of extraordinary art projects which have excited and inspired people around the globe. Jerram has a set of different narratives that make up his practice which are developing in parallel with one another. He is known worldwide for his large scale public artworks. The Street Pianos webpage dedicated to this piano (#11) says it was decorated by artists Kyllan Maney and Erin Peters and the Creative Catalyst team. It was donated by Mesa Arts Center and sponsored by Advanced Eyecare of Arizona. What I didn’t know until I looked at the aforementioned webpage dedicated to this particular piano is that it was lit up at night. How cool is that! (Very cool, I think. I wish I had seen it all lit up.) The area behind the panel that reads “Play Me, I’m Yours” apparently glowed electric lavender, and a bright blue light shone from underneath. Again, I wished I could play this piano, but I made myself content with simply striking a few keys and and enjoying the art. In the spring of 2016, I was exploring the public art on Main Street in Mesa, Arizona. 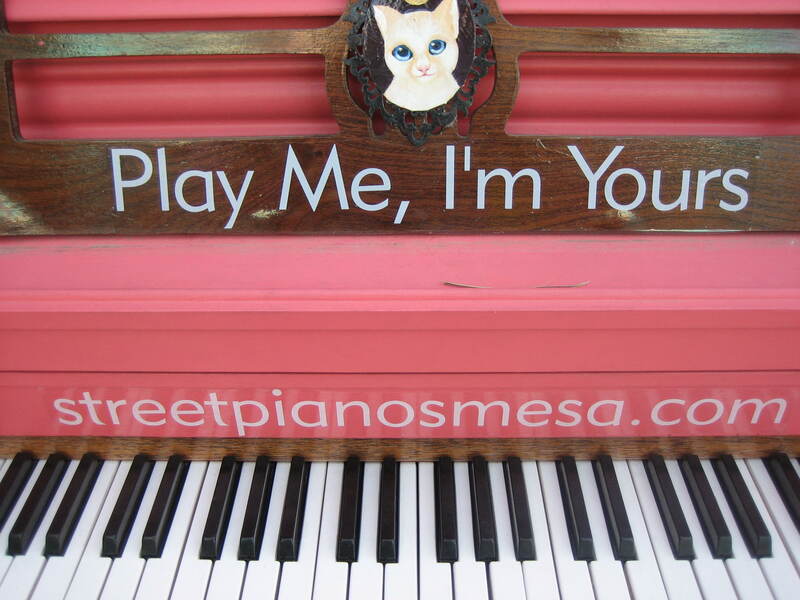 One of the coolest things I saw was a Pepto-Bismol pink piano labeled “Play Me, I’m Yours.” What was this about? I had no idea, but loved the presence of a piano out on the street available for anyone to play. As I walked further east on Main Street, I encountered two more street pianos. Very interesting, I thought. 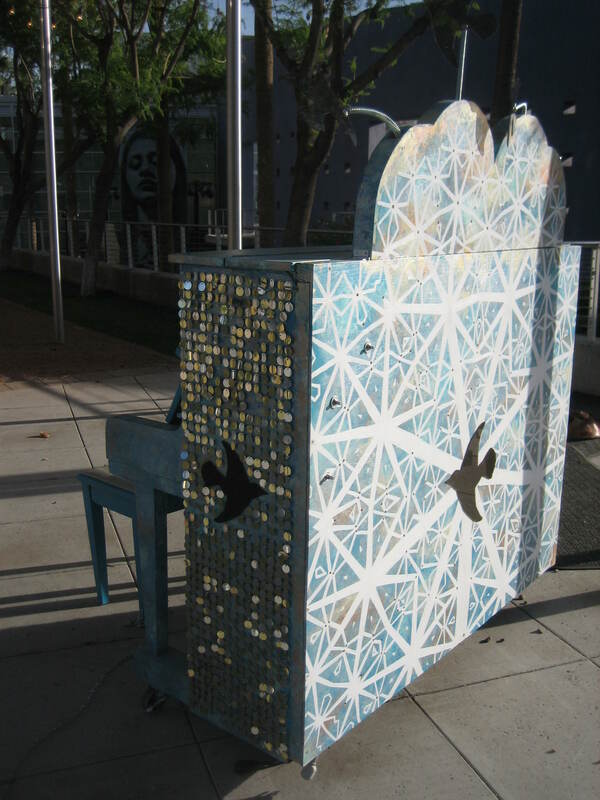 I figured the pianos were part of downtown Mesa’s permanent sculpture collection and didn’t think much more about them until I sat down to write this post. It’s really cool to find out the pianos I encountered are part of a global phenomenon. But wait, it gets better! 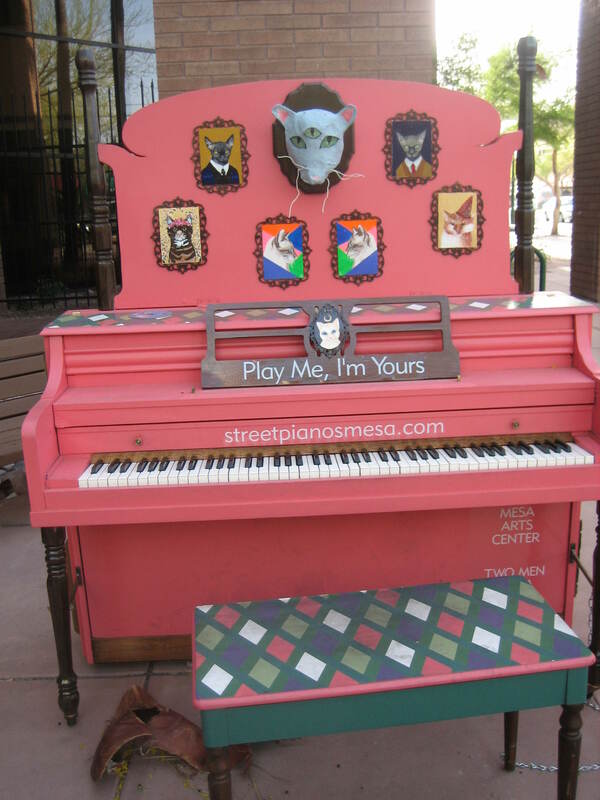 I’m going to do three blog posts about the three Play Me, I’m Yours piano I encountered in Mesa. Today I am writing about piano #6, which was located on Main Street, east of MacDonald. 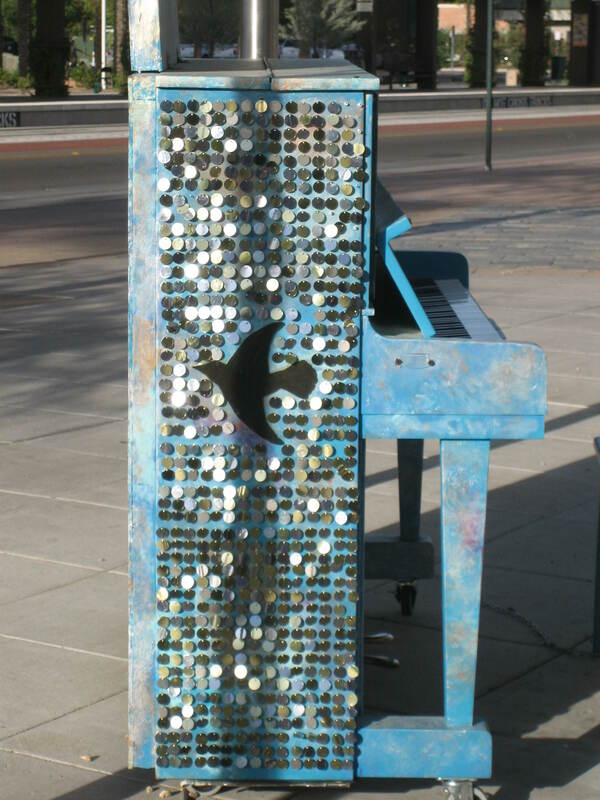 According to the Street Pianos website (where you can also view videos of people playing this piano),i t was decorated by artist: Kyllan Maney and students of the New School For The Arts and was donated by Myrna Horton. works with aspects of nature that reminds her of the feelings of tranquility, discovery, spirituality and awe that exist when looking at plants and objects closely. 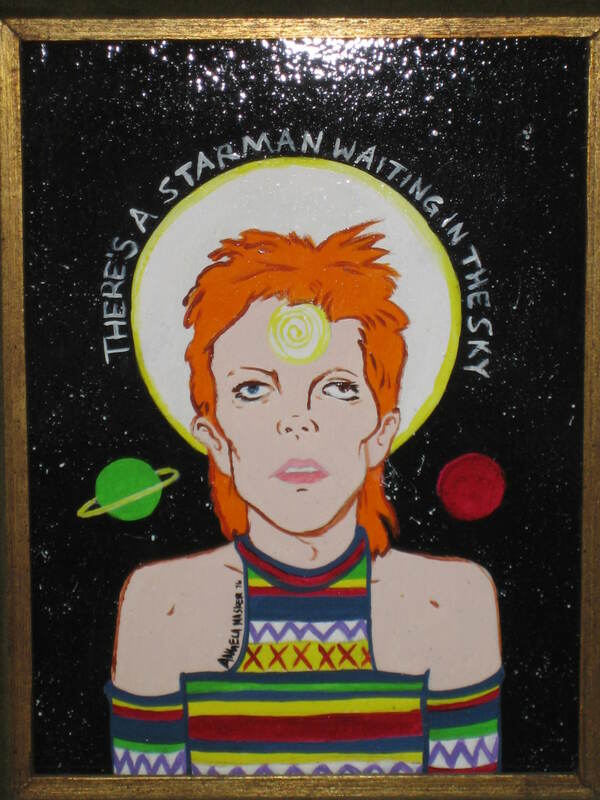 The visual foundation of Kyllan’s work is rooted in scientific illustrations, religious icons, human relationships and inspiration from past and current artists. Kyllan enjoys the inventive, creative process of working with mixed media, oil painting and large scale murals. There’s so much I like about this piano. I think its bright, eye-catching color is grand. I like the individual portraits decorating it. As I said before, I think it is so cool to see pianos out and about, available for anyone to play. could afford when I was a kid, and by the time I took a piano class in high school, it was too late. I realized I basically have no musical talent, and it was going to take way more effort than I was willing to exert to learn to play the piano (or anything else). That evening in Mesa, I was sad I couldn’t sit down and coax a song from this instrument, but I was glad to know it was out there waiting for someone more talented than I . To read more about public art in Mesa, go here: http://www.rubbertrampartist.com/2016/10/07/the-big-pink-chair/, here: http://www.rubbertrampartist.com/2016/10/15/booked-for-the-day/, and here: http://www.rubbertrampartist.com/2016/11/14/quackers/. Today’s guest post is from Devan, an internet friend of mine. We haven’t yet met in person, but I hope we can someday soon. Devan kindly offered the following inspirational piece to me for use during this busy time. I had been at work since before 9 AM and it was now after 8 PM. All I really wanted to do was settle in for the night. Unfortunately, toilet paper is an unforgiving need when you’ve run out. As I made my way through the drug store near my home, I could hear an unusually loud woman talking about the price of Oreos. Then, as she must have passed the liquor aisle, she spoke about a particularly raucous night involving a cheap bottle of vodka and a hat with a feather in it. No matter where I went in the store, her voice carried. I heard every word as if she were talking to me directly. I shook my head and rolled my eyes, marveling at the inappropriate public display. With large 9 roll pack of toilet paper under my arm and medicine for a developing headache firmly in hand, I headed to the front of the store. As I rounded the corner to the registers, I saw the loud woman and her quieter female companion had beat me there. They were a colorful pair. The loud one was very tall and curvy. Her leggings were black and white striped and she wore a short shirt that showed her bare belly. Her hair was shoulder-length, wild, messy and frizzy. She wore a huge welcoming smile to accompany her gregarious nature and carried herself with enviable confidence. In one arm she carried a large box of tacos from the restaurant next door (it was $1 taco Tuesday), a backpack in the other. The quiet one was shorter, had a robust figure, and wore a generously sized t-shirt and yoga pants. She had long straight unkempt hair and was very pregnant. She too kept a smile on her face. It was a bashful awkward smile, but it radiated warmth. Her eyes looked down most of the time, glancing up shyly on occasion. She was rolling a small suitcase on wheels behind her. The cashier was a cute young girl named Ashlee with unnaturally red hair, several tattoos, and facial piercings. Because of her alternative look she often got strange glances from customers. Yet she never seemed to get frustrated with anything or anyone. As I stood in line, I found myself growing frustrated with the 2 women in line in front of me this particular evening. 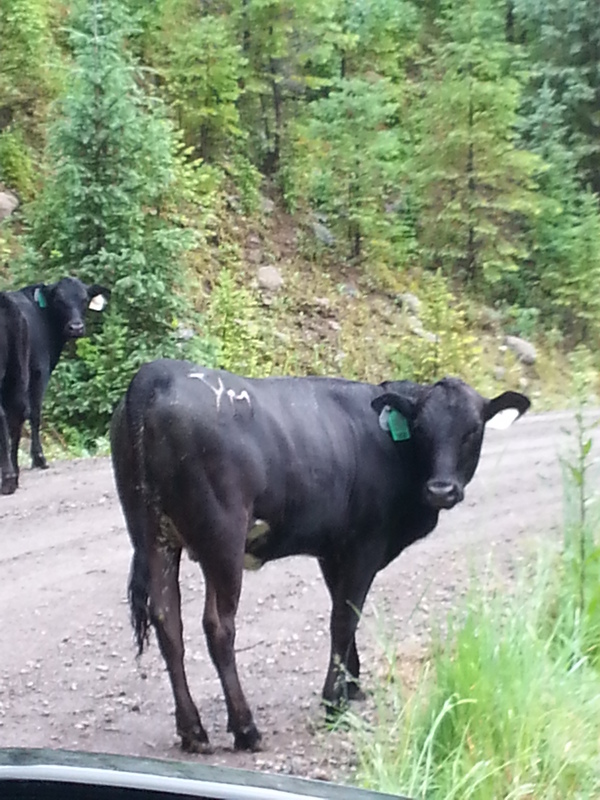 They had no sense of urgency at all and had questions about everything. Ashlee, as usual, began friendly small talk while checking out their purchases. During this small talk, it was determined that the women had gotten a ride there, but didn’t have a ride home. They laughed that they were short on bus fare as well, after getting food and milk, so they would be walking home. To my complete dismay, Ashlee enthusiastically encouraged the women to allow her to pack their backpack and suitcase in the most optimal way, to prevent having to carry anything too heavy. As I stood there aggravated and just wanting to leave, Ashlee proceeded to work their items into their bags. She carefully placed the heaviest items in the rolling suitcase and the lighter ones in the accompanying backpack. It took much longer than if she had simply put everything in the store bags and left them to deal with it, but the women glowed with gratitude. Ashlee then asked for the awkward box of tacos they were carrying and slipped them into a bag for easier transport. The women left with big smiles on their faces and, I assume, began their journey home. As the women left the store and I approached the register, Ashlee greeted me with that same kind smile and an enthusiastic “Hey! How are you today?” My grimace quickly melted into a broad smile. I forgot all about my aggravation as we chatted and she swiftly moved me through the checkout. As I was leaving the store, as I often do, I felt appreciated and valued. Not just as a customer, but as a human being. The same feeling the two women in front of me were likely feeling as they left the store. 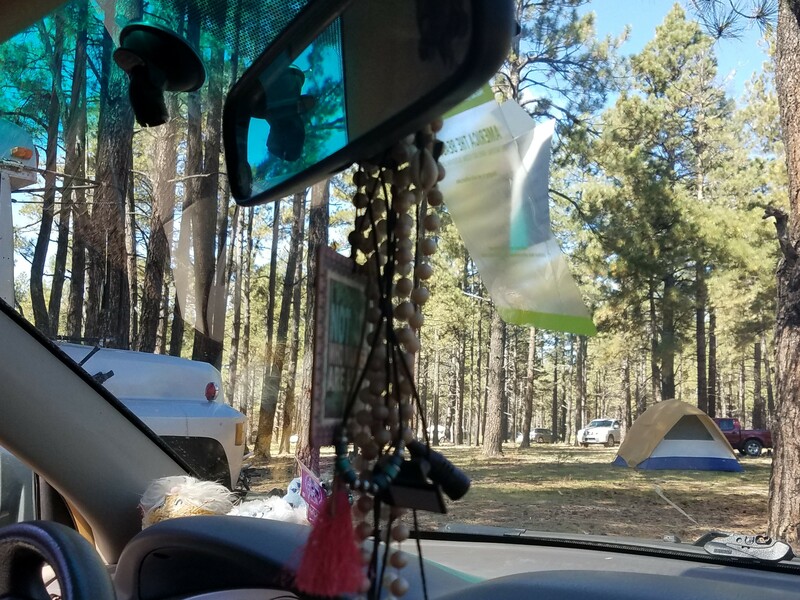 When I got to my car and opened the door to get in, I glanced back over my shoulder to the store exit. The elderly lady who had been behind me in line was walking out of the store with a beaming smile, her small bag in hand. I knew the smile that brightened her face was because of Ashlee. In less than 10 minutes, Ashlee had touched the lives of 4 women with her positive, kind, and compassionate nature. She had definitely changed the mood of everyone’s evening. More importantly, she made me realize how frustrated and judgmental I had been toward the 2 women in front of me. I laughed at myself the entire drive home. I often think of the two women in front of me that day. I wish I had been more patient and kind, perhaps offering them bus fare or a ride home. I am grateful for them. I am grateful for Ashlee. I am grateful for this experience, reminding me the importance of basic kindness and the impact it can have on each person we encounter. Now, when I interact with anyone in line at the store, waiting at the DMV, in the Dr.’s office, etc., I try to remember that no matter how crazy my day may have been, someone is having a struggle that is far worse. A kind smile or gesture just might lift their day a little, just like Ashlee did for me. Devan is a 40-something single female blogging online as Xsyntrik Nomad (xsyntriknomad.com). Committed to the dream of a simple but adventurous life, she is rarely found in one place for long. Her preferred ‘home’ is a converted van in which she can freely explore every corner of the country, with her two feline companions in tow. Devan is a positive living enthusiast who strives above all else to live a happy, kind, and inspired life. She hopes to motivate others through her writing and by sharing her journey. Once again, I must apologize for waiting so late in the month to post this report. November has really gotten away from me, and the spending reports have really been bringing me down. I know October will turn out to be a particularly expensive month, since I went on a little visit to San Francisco and paid for a lot of restaurant food. Several of the places I bought food didn’t hand me a receipt, so I’m not positive I included all expenses this month, but I think I did. If you are interested in how this spending report project came about, you can read this post: http://www.rubbertrampartist.com/2015/12/31/spending/. If you want to see spending reports from previous months, type “spending report” into the search bar.